The following film will give you helpful tips on caring for patients with the abduction cushion medi SAS 45. The medi SAS 45 can be used for either the left or the right shoulder. Measure the patient's abdominal circumference to determine the correct size. Patients with a circumference above 104 cm require sizeL while patients with abdominal circumferences of less than 104 cm require size. 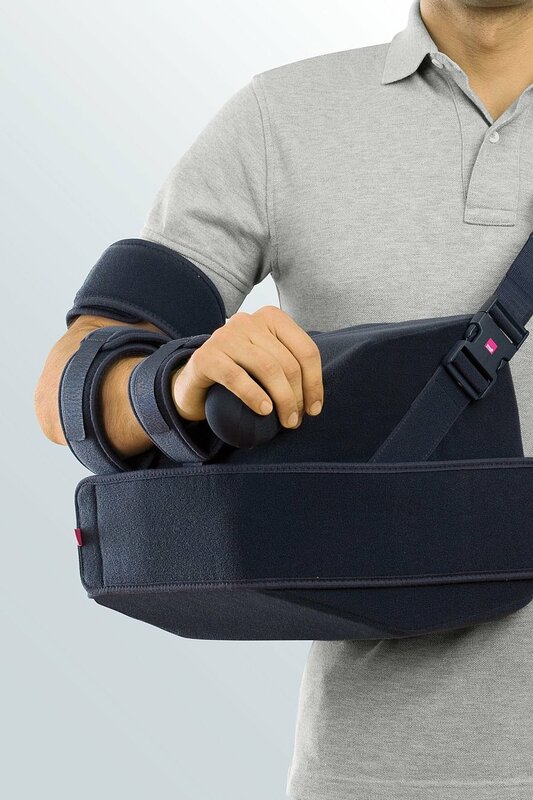 For postoperative use, the medi SAS 45 orthosis is usually fitted to the patient while he is still in the operating theatre to avoid harmful movements of the operated shoulder when the patient is repositioned. This is possible with the patient lying on his side or on his back. The product can be set to 30° or 45° abduction. The cushion's rectangular shape determines the angle. With the short side facing upwards, the orthosis holds the arm at an angle of 45°, the other way up it holds the arm at a 30° angle. Position the hand rest length-wise at the end of the slanting surface of the cushion. The hand on the side of the operated shoulder must be able to clasp the ball on the hand rest. Position the arm loops along the hand rest with the Velcro. Start with the smallest loop one hand's breadth away from the ball on the hand rest. Attach the upper arm strap to the back of the cushion with Velcro over the top edge. Now check that the shoulder strap is properly positioned. The Velcro fastener on the side should face upwards towards the medial side of the abduction cushion. This makes it easier to wear later. The orthosis can now be fitted to the patient. First open all the loops and the fastener on the front of the shoulder strap. Position the abduction cushion in slight internal rotation between the forearm and the hip. Place the arm and the forearm in the loops and close them. The hand rests on the ball on the hand rest. Make sure that the patient's elbow is resting on the cushion. Otherwise you can slide the hand rest a little further forward. Then pass the shoulder strap over the patient's healthy shoulder and attach it to the end of the abduction cushion. Another strap should be passed around the waist to hold the cushion securely against the patient's upper body. The cushion is held securely in place by the second long strap. For this, pass this strap around the patient below the waist and fasten it to the front of the cushion. The orthosis can be further modified after surgery for more comfort in wear. 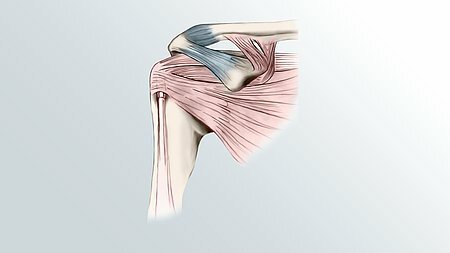 An additional axilla strap can be attached for effective relief of the shoulder and neck region. The length of the shoulder strap can be adjusted individually using the Velcro fasteners. You can also shorten the shoulder strap by removing the Y-fastener, cutting the strap to the desired length with scissors and re-attaching the fastener. 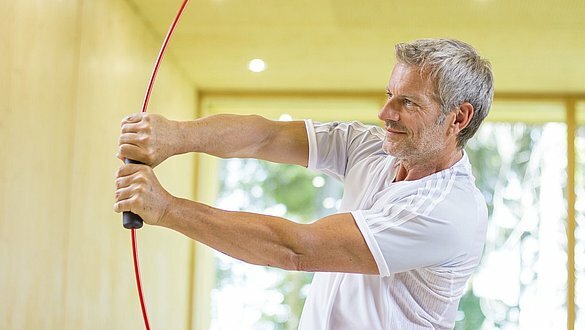 When adjusting the length of the shoulder strap, make sure that the arm and the forearm are resting against the side of the upper body at an angle of about 90°. Also make sure that the length of the shoulder strap allows the patient to stand up straight and relaxed. Once the orthosis has been adjusted properly, the patient can put it on alone, also after the operation depending on the range of movement. Click here for more information about medi's SAS 45 abduction cushion.